CEW beauty awards winner 2015. With honey, raspberry seed oil & hyaluronic acid. Made by British bees. Instantly plumps, firms and smoothes. Softens the appearance of fine lines & wrinkles. Skin looks and feels intensely hydrated. Skin looks dewy with a youthful luminosity. Suitable for all skin types, especially mature or ageing skin. Not tested on animals. No parabens, synthetic colour, mineral oil, silicone, SLS or SLES.This intensive daily moisturiser is bursting with super-hydrating British honey antioxidant-rich propolis and potent raspberry seed oil, rich in moisturise-boosting essential fatty acids, to improve the visible signs of ageing and leave skin with a bee-autiful, youthful glow. Hyaluronic acid retains moisture in the skin's cells, helping to plump and soften the appearance of fine lines and whilst concentrated algae tightens and strengthens the skin. How to use: After cleansing, morning & evening, gently smooth a pea-sized amount onto the face & neck until absorbed, avoiding the delicate eye area. 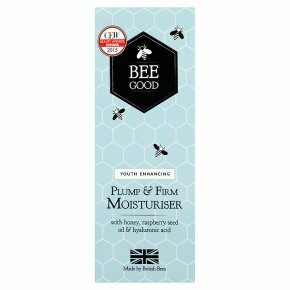 For best results, use after Bee Good Youth Enhancing Hydrate, Smooth & Prime Serum.